Alright, time to be extremely unpopular. I didn't like this book. It pains me to say it because I really wanted to like it. I actually tried to talk myself into liking it, but I just couldn't. I feel a little relieved to admit that. Now don't get me wrong, there were some really deep and interesting parts of the novel and lots of thoughtful quotes, but it just wasn't for me. Why wasn't it for me? I felt like the young protagonist Mim was a little too mature and philosophical for her age. There were so many times where she would just stop and go off on a tangent that took some serious attention, and I felt that these tangents did not really add to the story. The words are beautifully written, but I just didn't feel like I could connect to them. It has been difficult for me to right negative things about this book because there were definitely some important life topics discussed. I appreciated the novel in that sense, but I still just had such a hard time connecting to the characters and I think that is really what made me dislike this book. 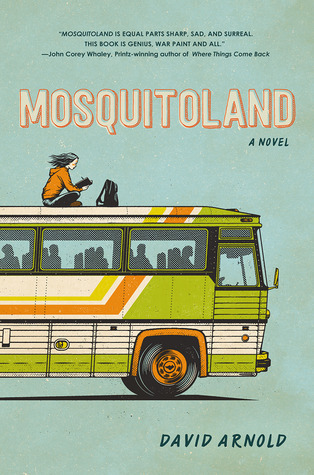 The style of Mosquitoland was quite similar to some of John Green's novels, so if you are a fan of that type of book, I would suggest giving Mosquitoland a shot. Just because I didn't like it doesn't mean you won't!